Adapting a bestseller in to a film is always extremely risky, as there is always the chance that you will be vilified by fans of the book who take against the film for removing all of its magic. Films like the dire ‘The Cat In The Hat’ have suffered this fate, provoking the ire of fans who were wholly unsatisfied with what they saw and made that clear by letting other fans know that is was no good, thus inhibiting the studio’s attempts at making a sequel. ‘The Fault In Our Stars’ by John Green is not only a bestseller, but a book by a man who has a dedicated following on YouTube who would be prepared to kick up one hell of a fuss if this film wasn’t to their liking. As an unapologetic member of that community and buoyed by the fact that Green himself has been nothing but positive about the process and the film, I went to see this touching tale of two cancer patients and their blossoming relationship hoping for something as emotionally resonant as the smartly written book was. What we get is something that doesn’t quite manage to capture all the charm and delightfully acerbic wit of Green’s novel, but is a faithful and well written piece in its own right, bolstered by strong performances from its talented cast. Shailene Woodley is very good as Hazel Grace Lancaster, a sixteen year-old girl whose particular type of cancer means she struggles to breathe, requiring a portable oxygen tank to do so. 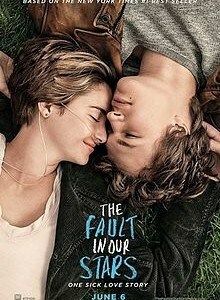 She reluctantly attends a support group for cancer patients, where she meets Augustus Waters, a former osteosarcoma patient who only comes at his soon to be blind friend Isaac’s behest, setting in to motion a series of events that give her life an extra dimension she never thought she was going to have. Woodley’s main strength is her brilliantly realistic portrayal of someone whose whole life should be ahead of them, but who is always acutely aware that for them that isn’t the case, that innate sense of the inevitable shaping the way her character progresses throughout the film, and it’s all down to Woodley’s nuanced performance, making something that could have been too mawkish much more involving. She’s ably aided by Ansel Elgort, who is suitably sincere as the charming Gus, and beginning to make a name for himself as an actor destined for larger and larger roles. There are also great performances from the likes of Nat Wolff, Laura Dern and particularly Willem Dafoe, whose scenery chewing is immaculate and makes for highly enjoyable fare. You would expect nothing less from such a good actor. Director Josh Boone may have lost some of the fantastic sense of attachment that Green’s novel astutely coaxes you in to as you travel inside Hazel’s head, but this sense of detachment becomes a way for us to imagine the characters separately from Hazel, and gives it a different dimension it didn’t have on paper. That’s the sign of a good adaptation: it recognises where it can’t match up to the book, and comes up with something a little different to make sure it doesn’t lose by too much. Scenes that could have felt cringeworthy when you’re no longer experiencing them inside someone’s head manage not to be and it becomes clear that at its heart its aims are sincere. It may be a melodramatic look at the way cancer patients try their best to live normal lives, but it definitely resonates on an emotional level and makes it good fun to spend a couple of hours with these characters, through the laughs and the tears.